Searching for the true picture of how rationally the municipal bureaucracy behaves and whether for the citizens’ benefit, the SCOOP research team visited several municipalities. Under the Law on Free Access to Information, it addressed all 82 municipalities. From most of them we received data and documents on how and what the mayors and their administration spend the money of their fellow citizens for. The SCOOP research team sent requests for free access to public information to all municipalities in the Republic of Macedonia. Municipal officials were requested information on the municipal budgets, annual sums for representation expenses, as well as invoices for representation in the last five years, that is, from 2012 to 2016. The Municipalities of Resen and Chashka referred to the Law on Personal Data Protection, that is, documents that contain personal data whose disclosure would violate the personal data protection. Namely, pursuant to Article 10, paragraph 1, line 6 of the Law, this is public information: “The information holder is obliged to inform the public about: the organization and the costs of operation, as well as the provision of services to citizens in the administrative procedure and for its activities”. 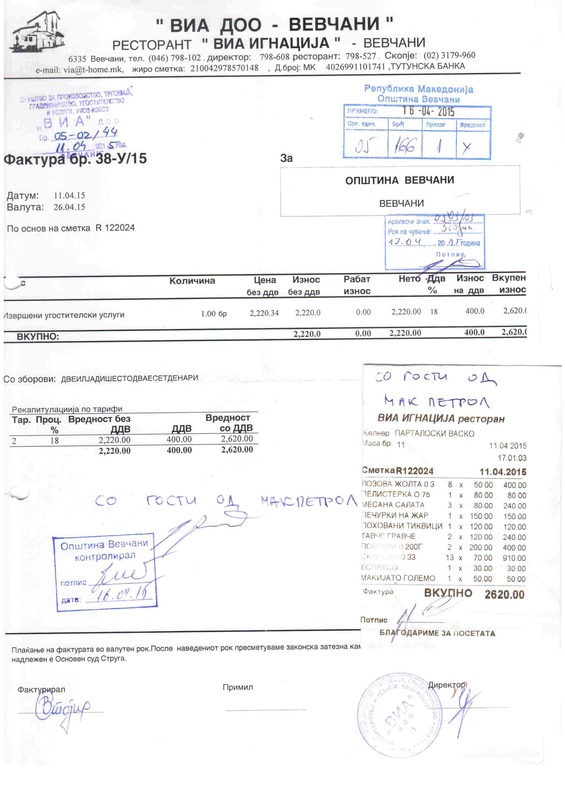 From Sveti Nikole the authorities responded that the documentation for invoices and receipts was given only to relevant institutions such as the Ministry of Finance, the Financial Police, court and auditors, and therefore they “could not” provide the requested information. Despite the complaint to the Commission for this answer, the municipal authorities are of the opinion that the documents (invoices, receipts) are not provided for in the Law on Free Access to Public Information and therefore they were not submitted to the applicant. Municipalities like Bitola, Gazi Baba and Vinica responded that the requested information was not public information. SCOOP journalist team sent complaints regarding the answers from these municipalities to the Commission for Protection of the Right to Free Access to Public Information. There were reactions to the complaints from the municipalities of Vinica and Gazi Baba and they submitted the invoices and the receipts for which there were registered changes for representation in the last five years. From the inspection in the invoices for representation of the municipality of Gazi Baba, it can be noted that the municipal employees were frequent guests in the restaurants “Moja kukja”, “Dojrana” and “Kamnik”, but they also visited “Bonimi”, “Veli-Iv” “Ragusa”, “Casablanca” and “Balkanika”. 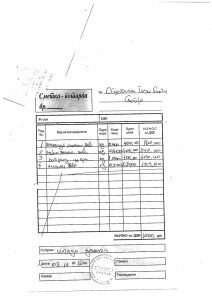 Among other things, from the invoices it can be seen that on several occasions alcoholic drinks and sweets were purchased by the municipality. Amounts spent on catering services at some of these restaurants reach up to 3,000 Euros a year. Also employees from the municipalities attended cultural events including plays, music festivals such as “Goce Fest”, “Rosa Folk Fest”, concerts and sporting events using municipal money. Regarding the complaint submitted for the response from Bitola, we received a letter from the Commission stating that the municipality had not responded to the Commission’s letter. The municipality of Bitola ranks first on the list for web transparency in the research within the project Putting People first implemented by the Center for Change Management and ALKA. It is absurd a municipality with 47% considered to be the “most transparent” in the Republic of Macedonia not to respond to the requests for Free Access to Public Information. The survey was conducted on 1,330 respondents in 8 major municipalities and it showed that generally, through websites, municipalities and the city of Skopje provide partial transparency but minimal accountability, with very limited opportunities for two-way communication and without electronic tools for consultation of citizens. In the area of ​​finance, most of the respondents consider that the following data are most needed: the LSGU proposal budget, the adopted LSGU budget, annual balance sheet, proposal and adopted civil budget and the report on realizing public procurements. 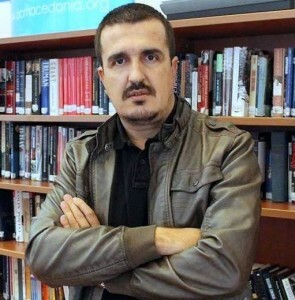 Vladimir Tevchev, a correspondent from Veles, says that municipal authorities always say that if something is posted on the municipality’s website, by definition, the whole public is familiar with it. “There are many people, especially elderly, who do not use the Internet and are not informed through the municipality’s website. That is why there are local media, local televisions that are very little used for this”. 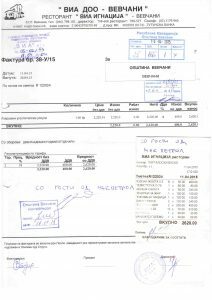 Although we did not receive the invoices from the municipality of Bitola, we received the sums spent annually for representation expenses. From the reply received, it is noted that it is about millions, but we cannot have an insight into what this money was spent on. An appeal was also filed to the Municipality of Ohrid. Upon the request to submit invoices, the municipality responded that because of the volume of the materials they were not able to send them, but they could be inspected in their municipality. So we traveled to Ohrid. Our attempt to inspect the documentation in the municipal building was disabled allegedly due to the political situation. More precisely because of the expired mandate of the mayors, explaining that the mayor could not put a signature on the documents that we asked from this municipality on the basis of the Law on Free Access to Information. Our indication that signature is not necessary, even unnecessary by the mayor or any other official in the municipality for legally obtaining the documents we request, was not accepted, as the documents are of public character and of citizens’ interest as it is about spending their money. Due to this ignoring and not providing a legitimate public insight in the invoices that record spending the money for representation, a complaint was filed by the journalist team to the Commission. The municipality responded to the complaint, i.e. it provided the requested information. Researching how, how much and what for the mayors and the other administration spend the municipal money, the SCOOP team contacted several journalists correspondents about their experiences and impressions on the topic we were researching. They also complained about municipalities’ non-transparency. “I do not have much experience about how the municipality spends public money. As for the journalists’ accessibility to the municipal authorities or, more precisely, the mayor, because not only in Veles, but throughout Macedonia, the municipalities are so centralized, only the mayor can make a statement. Not even the spokesman, where there is one, has authority to appear in order to make a statement. We have never had a problem in Veles so far, whenever we needed some kind of statement from the mayor of the municipality he was there. He rarely holds press conferences, but he often responds to journalists’ calls to make a statement. We, journalists, it is true that we are constantly informed about the events that are organized by the municipality of Veles, but these are events that are not vital for improving the life of citizens of Veles. So, if we summarize all that I have said, my opinion, my impression both as a journalist and as a citizen is that the municipality of Veles is not most transparent to the citizens”. Ivan Bojadziski, a journalist from Stip, says that despite his several attempts to get information on how and how much money is spent on representation expenses through the Law on Free Access to Public Information, he failed to get any answer. “It is one of the disadvantages of the abuse of power, because citizens’ money is abused in a rather vulgar way. Instead of redirecting it to address their needs, as well as the higher parts of the city that are already left without water because the water level in the wells has fallen considerably. We have situations in settlements to which roads have not yet been made, as well as holes on the roads, on the just asphalted roads and no one intervenes there, but they intervene in the restaurants“. Bojadziski says it is about terrible irresponsibility regarding the accountability of the first people in the municipality. But the Stip public wants and has the right to know where and how municipal money is spent, especially how much of that money ends up in various cafes, hotels, motels and fish restaurants. 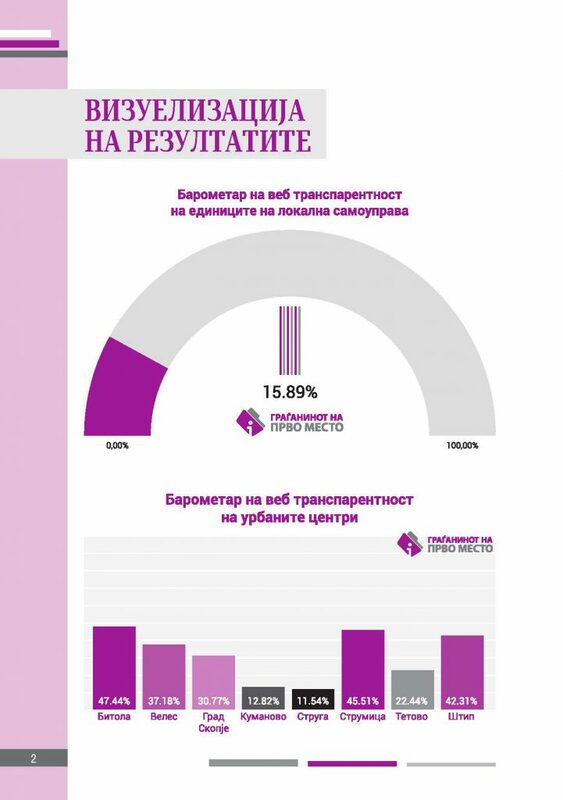 The research found that some of the municipalities in Macedonia have spent millions of denars for representation. Among them, the City of Skopje, Ohrid, Kavadarci, Iliden and Gjorce Petrov spent over 10 million denars for the last five years for representation. That is, annually, municipalities spent an average of 1,000 to 2,000 Euros. 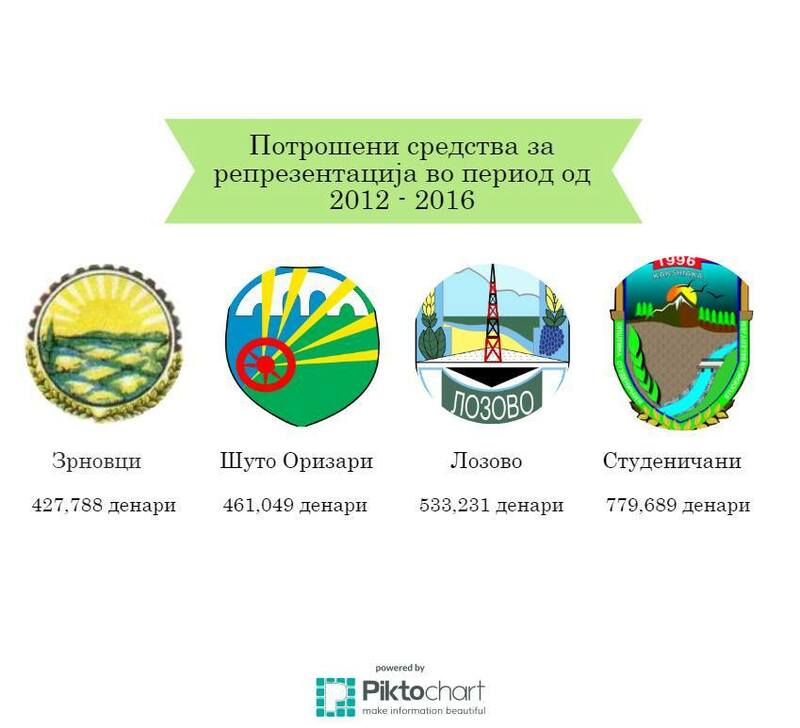 Of the smaller municipalities like Shuto Orizari, Zrnovci, Lozovo and Studenichani, the amounts spent for representation for the last five years was less than 1 million denars. Unlike big municipalities, within smaller ones catering services are usually averages of 100 Euros per day. Lunches include alcoholic drinks such as rakija, beer, wine. Grill, usually burgers, salads. They also drink coffee, mineral water, juice. At the end of the feast there is a dessert. Money from the budget allocated for representation expenses is also used for catering services for guests in the municipality. Thus, lunches for the guests in the municipality of Vevcani are on average about 100 Euros. Specific is the example with parties organized for the directors of “Makpetrol” and for the music group “Van Gogh” where 25,000 denars were spent for one lunch. The example with the municipalities Centar Zupa and Lipkovo is similar when guests visited the municipality. In the past years the authorities from the Municipality of Centar Zupa mostly cooperated with the restaurant “Kolonial”, “Amir market”, Tavern “Tsami” – Debar, Restaurant “Drilon” – Debar. It is a fact that in the Republic of Macedonia municipal money intended for representation is used without any strict rules and regulations. The officials buy fruits and vegetables throughout the year, daily lunch bills exceed 100 Euros and they even squander on sweets, candies, alcoholic drinks and gifts. The invoices also include stuffed toys, bunches of flowers, gifts and souvenirs. 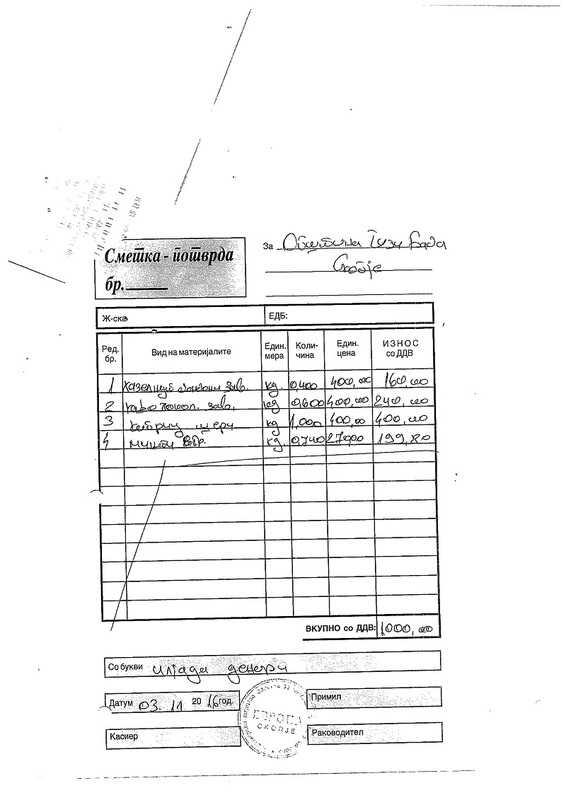 With this spending ambient of the citizens’ money, Macedonia is far from the foreign examples, where in the municipalities some of the mayors settle the “luxuries” using their own money instead of citizens’ money.